Time has come. We were expecting it. There was no way that the savage decadence of Israel would be accepted for ever. The Elohim, the Creators of all life on Earth, the Ones who brought the sons of Israel together to the Promise Land in order to built the Third Temple, the Embassy where They would come back, have withdrawn their protection to the State of Israel and have asked all genuine Jews, the ones who are peace lovers, the ones who carry true Judaism in their hearts, the ones who recognize Messiach Rael as Their envoy, to immediately leave the territory of Palestine. Over thousands of years, the Jewish people have been wandering around this planet as an uncomfortable guest, inspiring admiration, envy, contempt, hatred and love. No other civilization has shown such vitality and will to exist. It has survived hundreds of generations of ups and downs, declines and glories, including numerous and unsuccessful attempts by others to annihilate it. As the Chosen People, Jews have a mission to carry out. But perhaps we should say instead that there is no one mission in particular, but that our missions number as many as the talents of our people. Overall, we should be loving, caring and generous, and share our brightness with the rest of the world. Humanity’s progress owes a lot to brilliant, universal Jewish minds. Let’s find myriads of new ones in our midst! What does it imply to be a member of the Chosen People? Shouldn't it mean setting a standard of love and peaceful progress for all of humanity? This site is for the loving revolutionaries who are lovers of humanity, and above all others, a new kind of Jew: Jews for RAEL! As the Chosen People, Jews have a mission to carry out. But perhaps we should say instead that there is no one mission in particular, but that our missions number as many as the talents of our people. 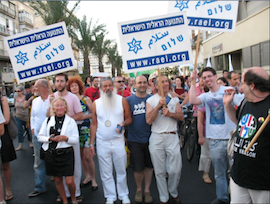 Jews for Rael are Jews who have decided to take part in the Raelian Revolution. Being Raelian imparts full meaning to our Judaism and enables us to be part of the true Chosen People, those who are active, universal and loving. To wake up each morning with the sincere and renewed will to bring love to all human beings. To refuse all expressions of passive old, dusty Judaism and always put modernity and science before tradition. Throughout their history, the Jewish people have been oscillating between the temptations of isolation and the risks of opening themselves to the world. No matter what hostile conditions they might face, openness is the only permissible attitude for Jews who want to continue being Jewish.